In 1829, a French artist and designer named Louis Jacques Mande Daguerre struck a partnership with fellow inventor Joseph-Nicephore Niépce to develop a method to permanently capture the fleeting images visible in a camera obscura. Niépce passed away suddenly in 1833, but Daguerre kept experimenting, finally achieving success around 1834. The daguerreotype process used a polished sheet of silver-plated copper, treated with iodine to make it light-sensitive, which was exposed (for several minutes or more) under a lens, then “fixed” using mercury vapor. 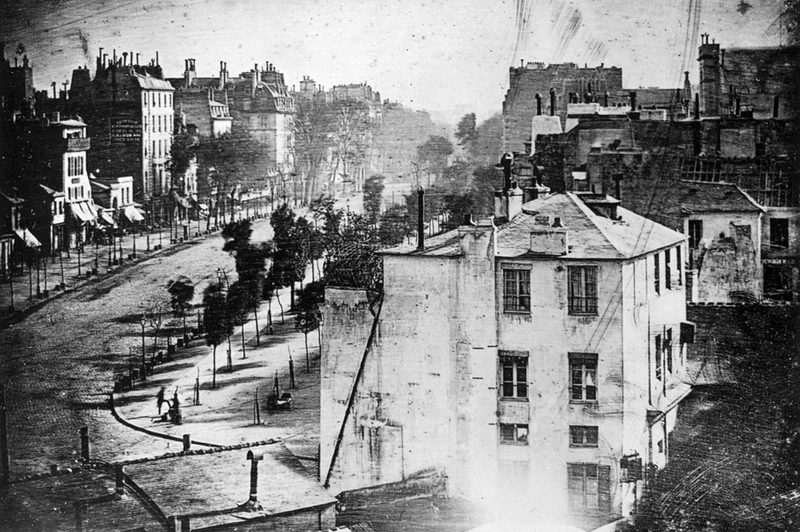 The existence of the process was first announced to the public in January of 1839—followed by an extraordinary move by the French government that would fuel the rapid growth of photography worldwide. Recognizing the enormous potential of this invention, the French government made a deal with Daguerre, acquiring the rights to the process in exchange for lifetime pensions for both Daguerre and Niépce’s son. Then the government gave it all away. On August 19, 1839, the details of the new daguerreotype process were presented to the public as a gift to the world from France.